12 Ft. - Select Composite Capped Grooved Decking - Saddle Trex Select brings legendary luxury to your home more affordably than ever. Durable and inviting, Select is the perfect, go-with-anything decking that retains its beauty for decades with only minimal upkeep. And when it comes to deck design, our Decking & Railing Duos can give you an idea of what's possible. Plus, you can feel good about your purchase, since Trex is made from 95% recycled materials. 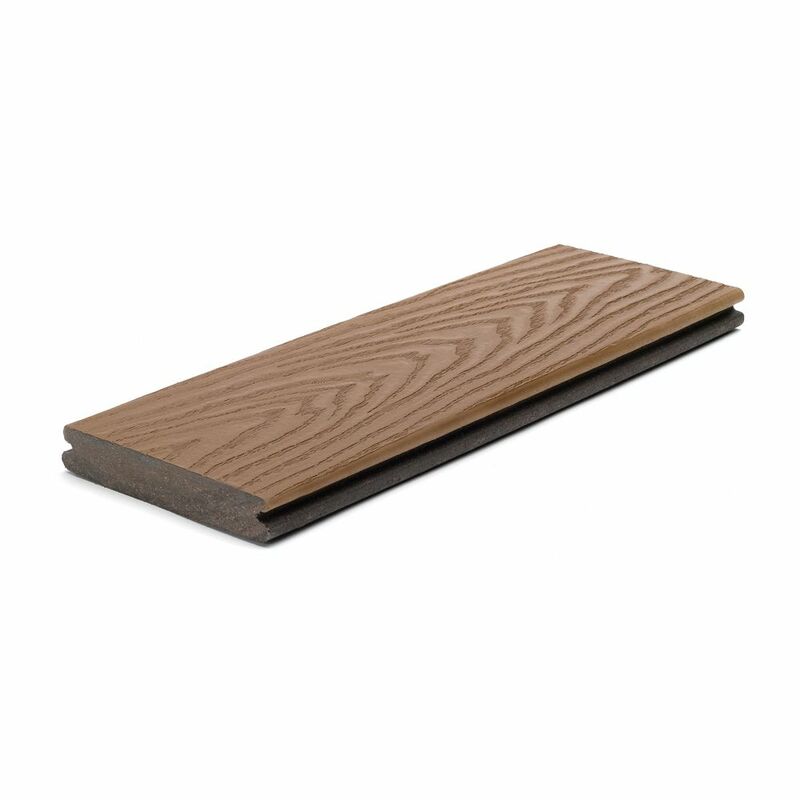 12 Ft. - Select Composite Capped Grooved Decking - Saddle is rated 3.0 out of 5 by 2. Rated 5 out of 5 by Donald from Great product I put this tree down on my deck at the lake 4 years ago.Very easy to put down.When it is dirty,I just power wash it.I have power washed it twice so far and still looks like new. Rated 1 out of 5 by Lori Leigh from Garbage! No matter what you try to clean it with, dirt does not come out. There is a haze over it. For the money spent on this product it is not worth it! We ended up buying two huge outdoor rugs to cover it up because it always looks hazy and dirty it is completely embarrassing. After spending thousands on a product we thought was worth the value we ended up covering it all up! We are in the process of building an additional deck, we would not use a Trex product again. Although, most of the composite decking seems to have changed, I don't trust Trex because of all the issues I've read and their apparent lack of response and warranty honoring. We'll take a chance with another brand. Do your homework first and read all the horrible reviews on this product.